In 1861 George Street was not yet part of the commercial centre of the City of Oxford, and New Inn Hall Street swept around the corner into what is now known as St Michael Street, leaving George Street out on a limb. Apart from inns and beerhouses (of which there were twelve that year), the only public buildings in the street were a Congregational Church and St George-the-Martyr (a very large chapel of ease now replaced by the cinema). The canal wharf lay just to the west of the street, where the Worcester Street car-park is now, and the City Gaol in Gloucester Green was just to the north. In 1861 well over 400 people lived in the houses on the street frontage, and in addition to this there were numerous families squeezed into the meaner houses in the eight adjoining yards, courts, and alleys. Most of the houses of George Street were in the parish of St Mary Magdalen (which was very overcrowded, hence its chapel of ease); but those who lived in the first thirteen houses on the south-east side of the street were in the Parish of St Michael-at-the-Northgate in Cornmarket. At the time of the 1861 census the boys of St Mary Magdalen parish went to school at Gloucester Green, while the girls and infants went to a school in Victoria Court, and although schooling between the ages of 5 and 10 would not become compulsory until after the Education Act of 1880, most George Street children of this age were attending school. But work started early: two servant girls aged 12 and three aged 13 lived and worked in George Street homes. 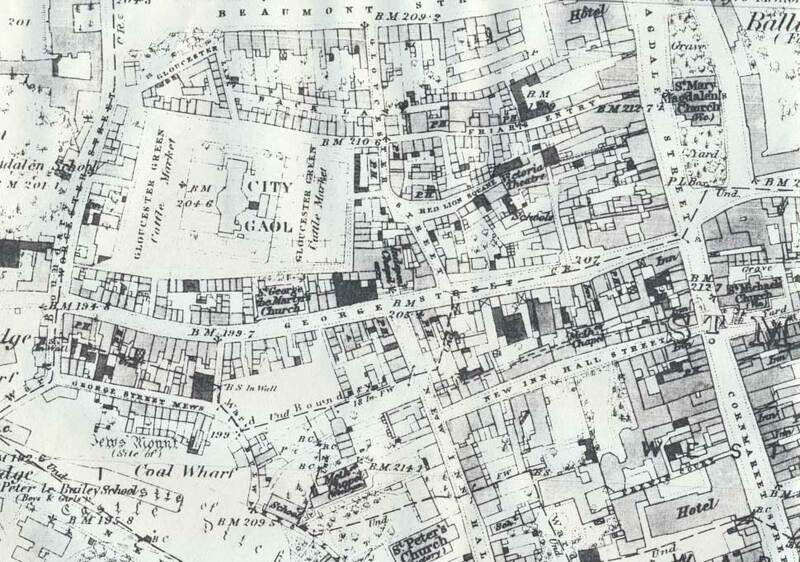 The 1861 census above offers a good opportunity to have a last glimpse of the street as it would have been in the middle of the nineteenth century. In 1872 New Inn Hall Street (which originally turned east and led to Cornmarket) was also extended northwards, enabling people for the first time to walk from the west end of Queen Street to George Street. This led to more shops in George Street, as shoppers could now do a circular walk comprising Cornmarket, Queen Street, New Inn Hall Street, and George Street. (This was to become known as the “bunny run” in the twentieth century.) New Inn Hall Street now forked in two directions, with the part that has now been given the name St Michael Street also called New Inn Hall Street until the twentieth century. Between 1881 and 1896 many shops and houses in George Street were demolished to make way for a boys’ high school, theatre, fire station, and corn exchange.